A light rain last night cleared the wood smoke and haze from the air, and the sun shone on a bright morning at Hotel Namaste. I breakfasted outside on pancakes with yak butter which tastes much like cow’s butter only more oily and has a tang– that might be because they have no refrigeration and it is a bit rancid. 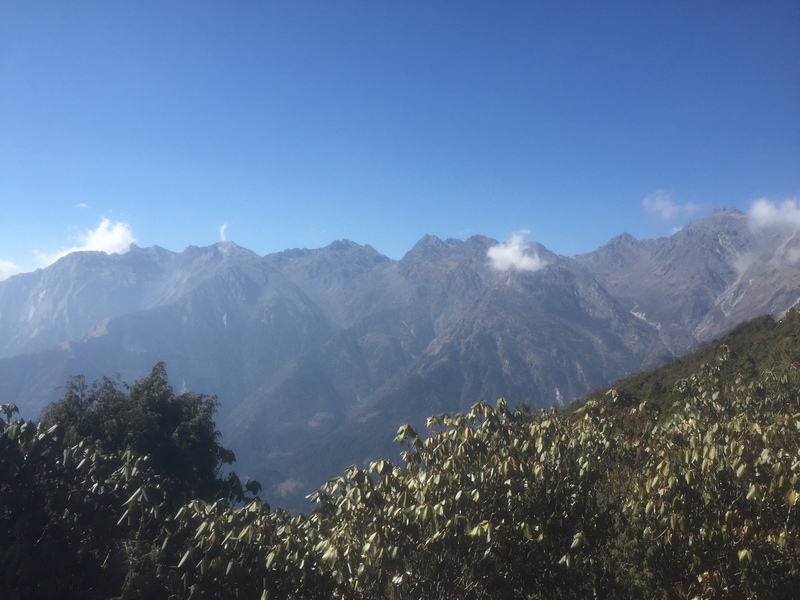 After making my farewells to the family, it was off to the longest ascent of this trek–over about ten kilometers going from 2470 to 3670 meters. For a little context, that is 12,040 feet. Mt. Katahdin is 5269 while Mt. Rainer is 14,409. This first bit was fairly level and good walking, and I soon arrived at a small village, more like a checkpoint, complete with automatic rifle toting military personnel charging 3600 NPR to enter the next part of the trek. Money is something of a concern as there is no way to use a card and most places places will not even take a 1000 NPR note. After the checkpoint, the path was very steep for about two hours. My cold (which has gotten worse) and the altitude forced many short breaks. Even though the sun is shining and I am sweating in just a t-shirt, there are patches of snow in the shadows and occasionally the trail ices over. The forests have transitioned from oak and beech to pine and juniper, but still have the ubiquitous rhododendron. By 11:00 I arrived at the outskirts of Mangengoth, stopping for lunch at the GreenView Lodge, a place run by relatives of the Namaste Hotel family. Like most larger buildings up in the mountains, the lodge has strings of prayer flags across the surrounding open space, and their fluttering always triggers old memories. When I was growing up in the valley of Virginia, the gas stations (what we called “filling stations”)–Esso, Sinclair, Cities Service — had traditional street signs but also decorated their lots with guy wires strung with multi-colored flags and spinning propellers. It was always easy to find a station because of the color and motion. Catching that moving color here out of the corner of my eye, I get a twinge of recognition. But here, up in these mountains, resting on a stone wall beside yet another ruin, the flags make it sound as if someone is still there rustling about. The descent from Mangengoth took me across fields past empty but still functional buildings, then the path got serious as it climbed up from 3420 to 3690 meters. That is definitely higher than I have ever been, but here it is still not above tree line. The forest remained primarily pine and juniper, though becoming more scrub-like as the afternoon progressed. Ahead was a peak the path would go around, but I could see that a recent rockslide had sheared off most of its face. As I feared, the trail rerouted at that point. The foot stones were fresh and there were small cairns signaling the way, but as it turned out, in order to get past the slip, the path went almost to the top, and my altitude sensitive muscles went on full alert. Until this point, the hour estimates printed on my map had been spot on, but the walk from Mangengoth to Thadepati Bhanjyand was listed as one hour and had taken 2 1/2. Not sure what the kilometer’s were, but at this altitude that is of little consequence. On that path I did scare up two magnificent birds which I think were pheasants– large, with bright blue head feathers that ruffled at the crown. Finally made it to Thadepati and debated finding a room there or descending to Melamchigaon. The latter was only another four km and all downhill, but it would be very steep. Not wanting to start something I couldn’t complete, I rested and evaluated my physical status. The Te Araroa had many long afternoon descents so I understood my limitations but needed to factor in altitude. At the top was a lone man who ran the lodge. We sat and talked as best we could, but mostly enjoyed the warm afternoon sun on those high rocks. I pushed on. It was a steep descent that took several hours moving rapidly through microclimates finally settling into a beech forest, a tree I’ve always loved though near the bottom the piles of leaves obscured the path which made me wonder if the beech here, like those in Georgia, hold their dead leaves until spring when the new leaves push them off. That would explain why here in late winter there are so many intact leaves obscuring the path. After crossing a rickety swinging bridge and climbing a hill, I found Melanchigaon, excited about visiting the Buddhist monastery there. Walking down the alleys–there is no main street–all was rubble. This town too was severely hit by the quake with barely a stone building left standing. The monastery was perhaps the saddest, with its beautiful multi-layered roof tilted and fallen. 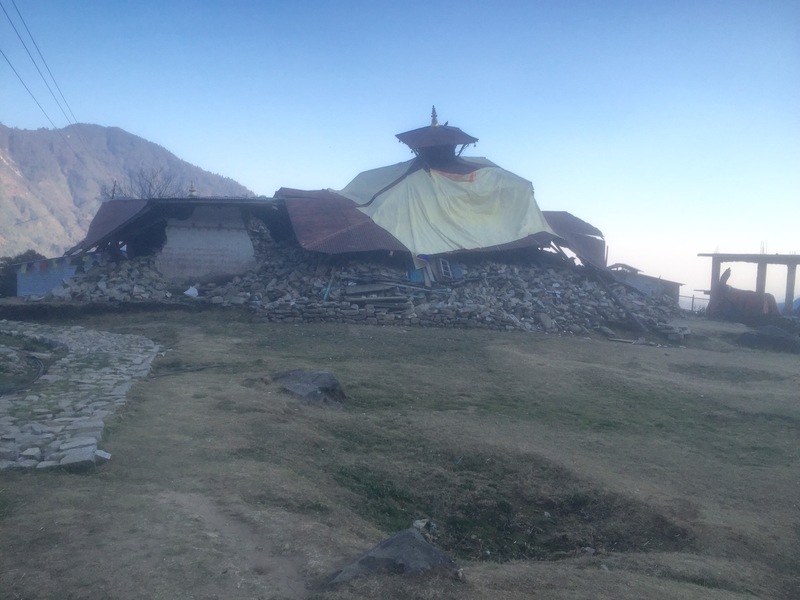 The Himalayan Lama Lodge had also fallen in, replaced by a wooden structure with a corrugated roof. I was met in a tiny entry yard by a man with a welcoming glint in his eyes who called himself a lama. His wife joined us, her face framed by a copper-colored head scarf, and we all three watched as one of their chickens pecked up the rice that had just been dumped on the bare dirt. I arranged for a room and dinner, and she kindly showed me my room, a space defined by 3/4″ boards set out under the large metal roof. It had several narrow cots and a breeze coming through the cracks and knots. Glad I carrying a 0-degree sleeping bag. Next door were the toilets, showing a certain humor in the face of such devastation. One labeled “Eastern toilet” was a traditional porcelain footprint over a hole with a bucket of water and dipper nearby. The other door, labeled “Western toilet,” opened onto a pile of rubble. For dinner, the woman offered a menu but her husband definitively said “Dal Bhat,” so it was settled. Still suffering from a cold, I took a short nap, then joined them for dinner. Like the Namaste Hotel, the room was low and dark. Toward the back were piles of bedding. This building was corrugated steel like so many others– hard to keep warm and equally hard to keep cool. Across the front wall were wooden shelves holding all of the food storage, condiments, and utensils. Along with huge teapots, the primary cooking pots were pressure cookers polished to a high sheen. All the metal pots, cups, and plates were scoured to a high shine, which I have a hard time understanding. Back in my Boy Scout days, cooking with aluminum cookware over an open wood fire would blacken a pot beyond cleaning. Here the brightware is bright and they seem not to even use soap. In the middle of the room by that wall was a wood stove. Set on a concrete slab, it was a u shaped low masonry rim about six inches high topped by a sheet iron plate with a large hole in the middle and a hole at the back for the steel pipe chimney. Wood was fed through the open front under the iron plate. I was invited to sit on the rug-covered floor next to the stove–the only warm place available–though I was careful to leave the space right beside the stove for my new friend, the somebody lama. He sat close, put his hand on my knee and smiled deeply, such a warm and welcoming man. 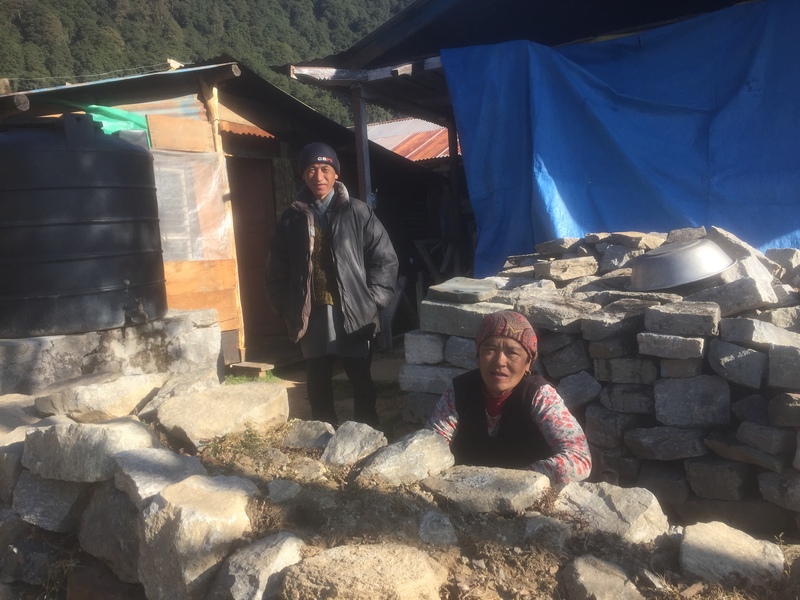 We shared few words but were able to determine relative ages –I’m 59, he’s 63–and then we both settled into the quiet while his wife prepared the meal. She did most everything though he would occasionally hop up to stir things or bring in more wood. She talked the entire time she was cooking, though I don’t think it was directed toward anyone in particular. Rather it was part of a marvelous choreography of gestures. There was no kitchen–no granite countertops (though I bet granite mined here finds its way into upscale American kitchens), no Sub-Zero refrigerators, gas range, or microwave, not even cabinets–but her skill and dexterity was a show, and of course the meal was excellent. We sat there together, huddled around the dying stove, each glowing according to our own satisfactions. Reluctantly I took my leave and groped my way in the dark back to my cot for a good night’s sleep.